1.25″ telescope eyepieces come in two forms. Fixed focal lengths and zoom eyepieces, such as 8-24mm for example. What you will find though with some Newtonian reflectors is that you can not get infinity focus. This is due to there not being enough inward travel on the focus wheel to adjust for such eyepieces. There are some fixes to get round this. 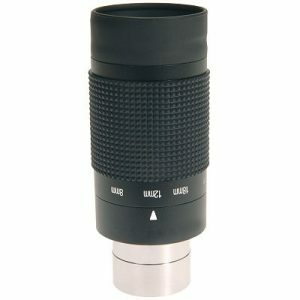 If available for your telescope, a low profile focuser may help. Also using the collimation screws to move the primary up the OTA. But get advice and help from a recommended dealership or local astronomy club if unsure. A third and most easy method is to use a barlow lens with the zoom eyepiece. Although this should work, you are also in effect reducing the focal length of the eyepiece (for example a 8-24mm will become a 4-12m if used with a 2x barlow), and reducing the overall quality, depending on the optics of the barlow used. This entry was posted in Hints and Tips and tagged eyepiece. Bookmark the permalink.